This 45 minute intermediate hatha yoga class for hips and heart class combines yoga for hips to connect with the pleasure of our second chakra and yoga for heart to open to our nurturing spirit in order to be able to offer the pleasure of nourishment to others. This gentle yoga class is full of hip stretches and yoga backbends that will help your hip flexors, hip muscles, tight hips and offer you the best of yoga backbends with heart opening yoga. We will begin with yoga hip openers half happy baby pose or ardha ananda balasana and happy baby pose or ananda balasana. From there we will move into a gentle backbend cat pose or marjaryasana. Pigeon is the next hip opening yoga for tight hips. Then lunge pose will help those tight hip flexors. Warrior one will also stretch your hip flexors. Matsyendrasana and Cow’s Face pose will get into those tight hips and are some of the best hip openers in yoga. We will finish with savasana and a mantra to open your heart. This class combines hip openers to connect with the pleasure of our second chakra and heart openers to open to our nurturing spirit in order to be able to offer the pleasure of nourishment to others. Part of being a yogi is taking all the benefits of our practice and offering it out into the world so that we can be of benefit to all beings. As the words lokah samastah sukhino bhavanatu say: May all beings be happy and free and may the thoughts words and actions of my own life contribute in some way to the happiness and freedom for all. By practicing these nourishing practices for the last twelve weeks we are now in a position to offer the resources we have gathered within to all of those we are in relation with. We have nourished our lives, the upward moving energy, the downward moving energy, the circulating energy, our sight, our hearing, our minds, speech, soul, and we have rested in that nourishment. We are nourished. 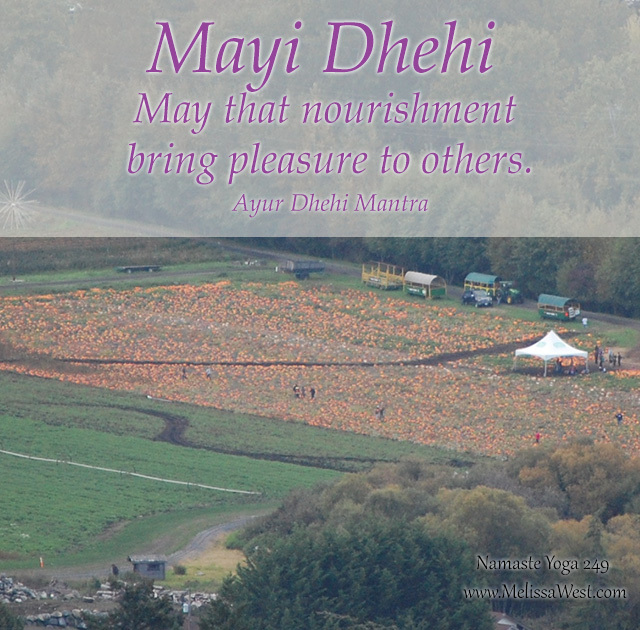 From that space of nourishment we are ready to offer the fruits of our practice to others. Mayi Dehi. Reflect on your life right now. What is it that you are trying to create, sustain, release or rebirth in your life. How could this class most benefit you? Begin for form an intention for what it is you would like to receive by practicing this yoga today. Perhaps there is somebody to whom you would like to dedicate the fruits of your practice. Go ahead and form your intention or dedication. Did you like today’s show? Share it with a friend or email it to a coworker. Like it and subscribe to our channel. Leave your comment below. Today’s question is: How do you take the benefits of your practice and offer nourishment to others? Want value added you can do on the membership site this week if you want to take your practice further? From the 5 Bhava series the class on Maternal Love – offering love maternally.